Get a breath of fresh prayer. Scripture-rich authority. Life-giving clarity. Everyday simplicity. FreshPrayer is a free, single-page prayer guide, designed to help you find clear, relevant ways to pray from specific scriptures for particular needs and concerns of people who are far from Christ. Each issue has a leaders’ guide to help equip prayer gatherings to be biblically grounded and focused. Use any of the released issues. Look for a different issue to be released every two months. Perfect to enliven prayer groups. Of course, you can use it on your own. But you’ll find that it’s perfect for small groups looking for innovative ways to pray together for people who don’t yet know Christ. 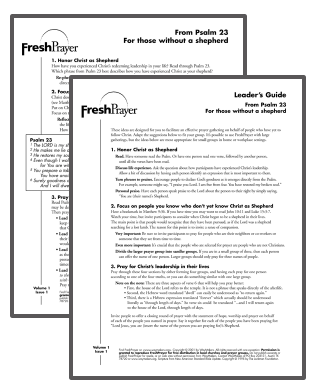 Each issue provides a participant’s prayer guide and a leader’s guide. You are welcome to copy either part for free distribution in your local church or prayer group. The participant’s guide. Easy to use by any individual anytime. Or it can be copied to put in the hands of all who gather to pray. The leader’s guide. Provides practical ways to that particular issue of FreshPrayer as a guide for an engaging one-hour session of life-giving prayer for others. Engaging prayer gatherings are guided, grounded and focused. FreshPrayer is a flexible tool designed to introduce a stimulating relevance to prayer gatherings. The guidelines help introduce fresh alternatives to conventional prayer meetings which tend to focus on lists of prayer requests. Probably the most significant part of each issue is the Leader’s Guide, offering practical ideas. Guided. The best prayer meetings are usually guided by a facilitator who brings a sense of pace, breaks large groups into smaller praying pairs and trios and directs attention to scripture by guiding short discussions. Grounded. Many relevant, clear and simple ways of praying spring directly from the truths of the Bible. Each issue of FreshPrayer helps ordinary people discover how to find their own words to pray according to the stories and statements of scripture. Focused. FreshPrayer helps prayer gatherings focus on praying about particular life issues that are faced by people who are not yet following Christ. As Christians learn to pray for God to advance His work in other people’s lives, there is often a growing sense of direction, purpose and expectancy. The WayMakers team previously published dozens of issues of FreshPrayer that are not now available. They are being revised. At least one newly-revised issue will be released every two months. Sign up to be notified of new issues. Use the story of Jesus honoring the faith of his friends to ignite your imagination. Pray for people who are now immobilized in spirit to soon wake up and follow Jesus. Celebrate seven marvelous unique realities about Jesus—the very things about Jesus that God wants to reveal to those who have yet to encounter Him. Your praise can become your best prayer. God declared that He was resolved to do incredible works of goodness: bringing healing, making peace and revealing truth. These great and mighty things are revealed as we pray. Pray three marvelous realities about Jesus: Christ as the life of God, Christ as truth itself, and Christ as the way to relationship with the Father­. People can be paralyzed by despair. Pray for God to help people overcome fears that God will do nothing, and instead, to hope, experiencing God’s glory in Christ. Pray with confident praise for what God has been doing, what He is doing now, and what He will do in the days to come. Pray in identity with–and hope for–those who are mired in predicaments and depression from which they cannot rescue themselves. Ask God to bring about a time of turning to Him in the lives of those you know who aren’t yet following Christ; call them God-ward in your prayers. Pray ideas based on the story of Jesus’ encounter with Nicodemus, an open-minded but hesitant seeker, perhaps like some friends or family members. Pray for people who are sleeping spiritually to be awakened by the light of the risen Christ. Pray for those who are far from God from the truths of Psalm 23. Pray that they would experience the shepherd-like love of Christ and be brought into full relationship with Him. Sign up here to receive an e-mail to alert you when a new issue of FreshPrayer is available. We respect your privacy and will not sell or spam your e-mail address.